Guest Post – Here Comes the Bride! Who Is She? Unfortunately, Israel was unfaithful to her husband from the very beginning (the golden cafe fiasco). After some time, Greater Israel was divided into two kingdoms: the Southern Kingdom-called “Judah”-consisted of the tribes of Judah and Benjamin. The Northern Kingdom-called “Israel”-was inhabited by the other 10 tribes. I cannot stress enough how crucial this is to understand: After Greater Israel’s division, “Israel” refers only to the inhabitants of Northern Kingdom; “Judah” refers to the inhabitants of the Southern Kingdom (this comes into play later in this study). Prior to the Kingdom being divided, Yahweh choose David’s bloodline to bring forth the Messiah, the Son Of God. Would God bring forth His son as an illegitimate child born out of wedlock? I think not. Yahweh remained contractually wed to the tribe of Judah for the sole purpose of bringing forth the Messiah at the appointed time. Some people like to say that God can do anything, but that isn’t technically true. God cannot lie. God cannot sin. God cannot be unfaithful to His promises. These things are not within His character. So how could Israel be brought back into a marriage covenant without Yahweh violating His own law? God’s solution to this divine dilemma was Yeshua! Yeshua Himself said, “I am not sent but only unto the lost sheep of the house of Israel.” God is not the author of confusion. These words were spoken because, at that time in Yahweh’s prophetic program, Yeshua was sent to accomplish a very important task. Northern Israel, being divorced from Yahweh due to adultery, can only marry another man if her former husband (who divorced her) dies. Yahweh sent Himself to earth as Yeshua (the Word Of God in the flesh) to die, thereby releasing Northern Israel from her fate as a divorced woman. 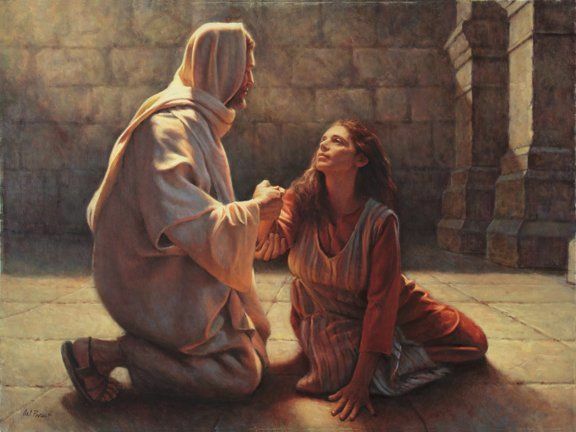 She would be free to marry another, who is none other than the RISEN Yeshua, the NEW MAN! But what about Judah? Was Judah still married to Yahweh? No! Yahweh’s death (as Yeshua) dissolved Judah’s marriage contract as well! Paul declares Christ’s relationship with His Church as that of a husband and wife (not that of a bride and bridegroom). Brides and bridegrooms are promised to marry, but not yet wed. Nothing more is needed to be done by the Body Of Christ to be one with Christ. In fact, we are called Christ’s Body because we are part of Him. How can the Bride be part of the Groomsman? It can’t! Yeshua is already married to the corporate Body Of Christ; The Body has just been growing in number (enlarging) ever since the Holy Spirit took on the role of baptism. The Body will continue to grow until the rapture. How can God marry someone He’s already married to in Christ? Again, He can’t. There is no need. Yeshua is one with the Father, and He with Yeshua. The Body is part of Christ. The Church, therefore, is not who is awaiting spiritual union (redemption) with Christ. Paul states that the Church is already redeemed! This obviously is spiritual redemption. Our souls receive the seal of everlasting life, but our physical bodies still continue to age and die. The Body Of Christ only waits for physical redemption. This physical redemption, our bodily resurrection, is not marriage. We are sealed for physical redemption by the Holy Spirit as a RESULT of our union with God. This is the blessed hope; that we, through our union with Christ, are not appointed to Yahweh’s wrath on those who reject Yeshua! False teachers were infiltrating the ranks in Corinth, and Paul was afraid that, in their immaturity and weakness (like Eve), their marriage bed would be defiled by their turning to a false Gospel. Paul presented them as a pure virgin to Christ when they were wed, and Paul wanted to make sure they would remain spiritually pure throughout their marriage. Without careful scrutiny, Yeshua seems to be telling Israel that they’re not the Bride. How can they be the Bride if He’s returning from the wedding at the 2nd coming? We must look at the original language to understand what is truly being said. The Greek word used for “return” is analýō, which means “ to unloose, undo again, to depart, break up, to depart from life, to return.” analýō is actually used only ONE other time in the Bible. It was used by Paul to describe how he desires to “depart” (to die) to be in the physical presence of Yeshua. Yeshua was telling Israel to “Let your loins be girded about, and your lights burning” so that they will be ready to wed after He dissolves their previous dysfunctional marriage with to Yahweh! This same message is given in the Parable Of The 10 virgins. The wise virgins are believing (faithful) Israel, the foolish virgins are unbelieving (lacking in faith) Israel. The wise virgins are who enter the kingdom with the BRIDEGROOM. Yahweh has appointed 120 years for man to exist on earth in separation from Himself. What did Yahweh mean by 120 years? They are jubilee years. Meaning, 120 jubilee years will pass until the kingdom of heaven is on earth. A jubilee year occurs every 50th year. Therefore mankind is appointed 6000 years before Yeshua returns to marry His bride and set up His kingdom, fulfilling the promise Yahweh made to Abraham and David. ← Rapture Timing – Feasts, Events, Wars, Birth Pains, Blood Moons and Eclipses, Day Counts, HELP!! !